It's the 20th day of Blogmas! 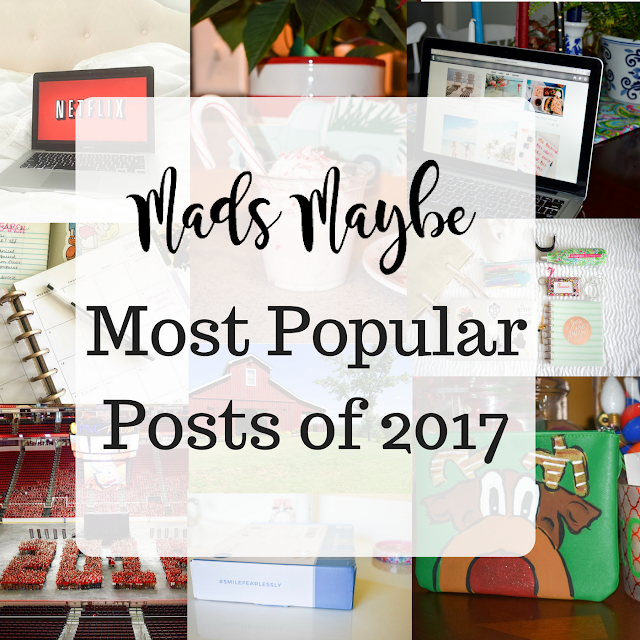 I'm mixing things up a little today and, instead of the usual Christmas themed post, I'm looking back on the Mads Maybe posts that received the most page views in 2017. All of these posts were published in 2017 all throughout the year, mostly ranging from April to just a few weeks ago! These are actually in order, starting with the absolute most overall page views. I hope you enjoy looking back on these and reading my commentary reflecting on each of them! I had no idea this post would be so popular when I wrote it! It really took off on Pinterest. I wanted to write a post about my favorite college non-essentials because there are so many resources out there telling incoming freshmen the things they definitely need, I wanted to talk about the things I quickly found out I needed/wanted in my everyday college life. I still firmly believe that my Red Bubble laptop stickers got me through college! This post was a collaboration with Smile Brilliant - I discussed my experience with their custom teeth whitening kit! I had a great time using their kit to whiten my teeth and I was really impressed with the results. We also partnered for my first giveaway on the blog so that was exciting! I wrote this post during my first August of NOT going back to school, post-graduation. I was really able to sit down and look back on the things I did in the first week of each semester that helped me succeed. I hope this helped some current college students and I hope it will help future college students within the next few years! There are so many things that become common sense as you go through school, it's easy to forget the times when you were new to this and didn't know these tips and tricks. Okay, talk about exciting! In May, my family was selected to barn-sit for the Chick-fil-A cows in Georgia and we ate Chick-fil-A all weekend! An actual dream come true. This was one of the best, most unique experiences I've had and I highly recommend checking out this post if you missed it! Two videos are included at the end of the post so you can get a full tour of the cows' barn! I started my Netflix favorites list in April and I've been updating it monthly as different content comes and goes on the website. Lately, it feels like a lot more good has been going than coming, but I won't get into that too much (Twilight and One Tree Hill). If you're ever in doubt and need a good movie or TV series to watch, bookmark my list because there's always something new! This post might not be super relevant to you unless you're traveling to Myrtle Beach, SC some time soon! The post breaks down my thoughts and preferences for two of the major dinner theaters in Myrtle Beach, Medieval Times and Pirates Voyage. I've always wondered if this post got picked up by some kind of travel website because it's pretty high up there to be so location-specific. Back at it again with the college posts! 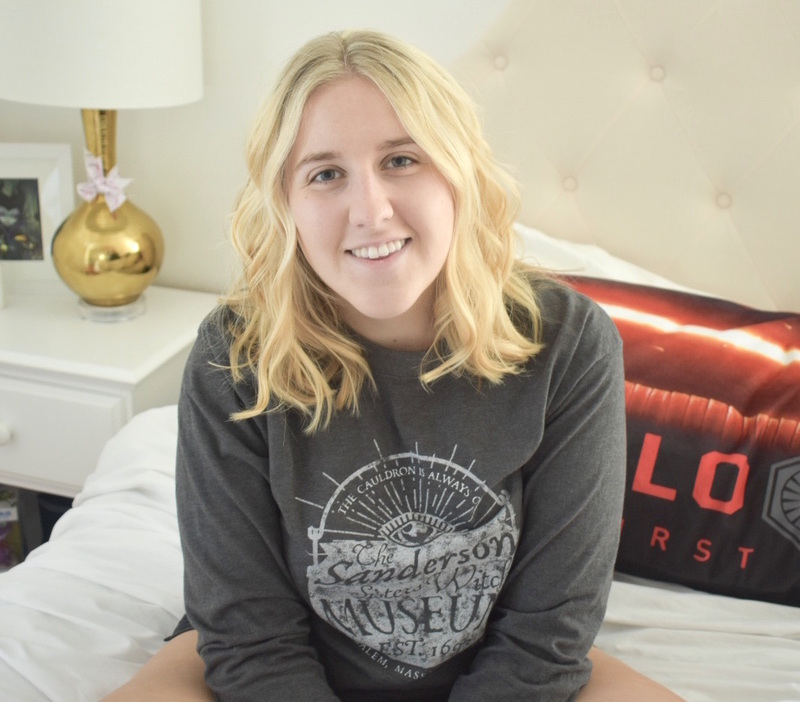 I enjoyed writing this post because it was fun to remember how different I spent my time freshman year (constantly doing work in the library) than senior year (constantly watching Netflix somewhere). Over the course of my time in college, I figured out how to best spend my time to maximize productivity while also giving myself a break sometimes and this post provides a lot of ideas for achieving that balance. Wow, a post from Blogmas made the top 10 list! It really made me happy to see this post getting so much attention on Facebook and Pinterest. I loved creating this recipe and putting the post together - it's such a festive and fun drink. I still want to see pictures if anyone else made candy cane milkshakes! What a gem! I broke down all of my strategies for every social media app that I'm on and provided some major advice in this post. I recently went through and updated the post with some new information that I've learned and new game plans I now follow based on trial and error. Social media is one of those things that's constantly changing and you have to change with it, but if you're new to any particular platform, this guide is perfect for finding your footing. Another Blogmas post! I have to admit, this is probably my favorite post from Blogmas because it's so cute! I love custom items that no one else has and my reindeer clutch is one of a kind! I still can't believe how simple and inexpensive it was to create. It's definitely not too late to create a painted clutch either! Even though it's almost Christmas, you can paint any scene onto yours and use it throughout the year. And that concludes my top 10 posts of 2017 list! I'm looking forward to finishing out the year with Blogmas and some more end of the year thoughts and reflections. I'm especially looking forward to 2018 and the new and exciting things that it will bring. Did you have a favorite Mads Maybe post from this year?